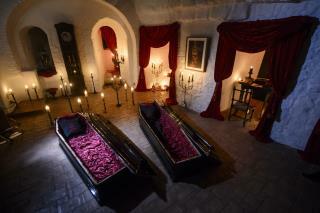 (Newser) – You could spend a night in Dracula’s Transylvanian castle—but sleep is no guarantee. Airbnb is offering two guests an overnight stay at Bran Castle in the mountains of Transylvania, fittingly, on Halloween night. The great grandnephew of Bram Stoker, who based his 19th-century novel on the very place, will host the person with the best explanation of what they would say to Dracula in a "face-to-fang" meeting, along with a guest, per the Telegraph. Whisked away in a horse-drawn carriage, the pair can explore all 57 rooms of the castle where Vlad the Impaler, the inspiration for Count Dracula, was once believed to have been imprisoned. Should they find a secret passage, it'll take them to a dining room where they'll enjoy a "blood-enriching" meal "prepared exactly as described" in Stoker's novel, Airbnb says. Cold, damp. musty, gee, I'll stay home. Vlad the Impaler had a "tooth" alright, but he didn't stick in in necks.....he lined the roads with impaled enemies standing semi-upright just to say "Hi." Warfare has never been pretty.